Sometimes your opinions get challenged. This happened recently when I received the new first issue of Worlds of the Unknown from the revived Spectre Press. This small press magazine contains the second “Elak of Atlantis” story written by Adrian Cole. Henry Kuttner wrote the original four Elak stories for Weird Tales that were published from 1938 to 1941. Adrian Cole has now written two Elak stories that are pastiches. A pastiche is described as an artistic work in a style that imitates that of another work, artist, or period. Robert E. Howard fans are very sensitive to the concept of pastiche as you had L. Sprague de Camp, generally with Lin Carter or in later years his wife Catherine Crook de Camp co-write Conan the Cimmerian imitations. De Camp was unfit in temperament to write Conan as he could not write a Conan story without someone else providing the plot. That is why he recruited Lin Carter who had a Conan imitation of his own, Thongor of Lemuria. Plots for Thongor stories were converted into Conan stories inserted within the Lancer paperback volumes as if they had co-equal status with the original Robert E. Howard stories. The stories would have been perfectly fine Thongor stories but as Conan, most fans found them wanting. It got worse with Conan and the Spider God which is probably 95% Catherine Crook de Camp in the late 1970s. Counterfeit Conan. Would have made a perfectly fine Thongor novel. Karl Edward Wagner was supposed to write three Conan novels though he managed to get only one written with accusations of sabotage by de Camp from Wagner. Wagner wrote a novel of another Robert E. Howard character, Bran Mak Morn, and failed to deliver a second promised novel so his statements have to be taken with a grain of salt. David C. Smith and Richard L. Tierney were hurriedly recruited to deliver a second Bran Mak Morn novel that was closer in spirit to Howard’s character than Wagner’s novel. The merchandising and exploitation of the Conan character took a nosedive with the Tor pastiche novels that started in 1982 with Robert Jordan starting the series that ran for 43 volumes by various authors. The nadir was reached in 2003 with Harry Turtledove’s Conan of Venarium where he hijacked elements of Robert Bloch’s Norman Bates character and grafted them onto Conan. John C. Hocking’s Conan and the Emerald Lotus is the one novel that closest in Howardian pace. Which brings us to the new Elak stories. Adrian Cole’s skill equals that of Henry Kuttner if not surpassing him. Cole captured the spirit of Kuttner’s tales adding something yet not violating anything in the original stories. Cole has done it before writing a rather good King Kull pastiche “Treason in Zagadar” (The Anthology of Fantasy & the Supernatural). Here we have a case where the pastiche though created, as an imitation is more than readable and not an embarrassment. I joked with Adrian that he could next tackle Rald of Forthe next. For those who don’t know Rald, he appeared in two stories in Weird Tales by Clifford Ball in 1937 and ’38. The idea did spring into my mind of an anthology of stories of old orphan sword and sorcery characters such as Rald of Forthe, Jirel of Joiry, Prester John/Wan Tengri or mid-period characters such as Gardner Fox’s Kothar or Lin Carter’s Thongor. It is probably too much to ask for above mediocre results. Pastiche just does not seem to work out well most of the time. Pastiche is rare in science fiction and fantasy fiction. The Conan pastiches are the most egregious example. A few other examples are Asimov’s Foundation and Roger Zelazny’s Amber. I have found much enjoyment when a writer is inspired by a classic work but creates something his own. 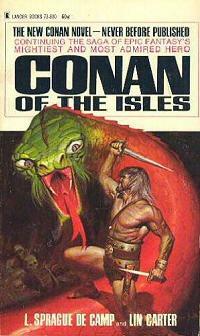 Poul Anderson for example wrote three stories inspired by Robert E. Howard for Planet Stories (“Witch of the Demon Seas,” “The Virgin of Valkarion,” and “Swordsman of Lost Terra”) that are much better than his Conan the Rebel. Tanith Lee wrote two stories for the Amazons anthologies that are a tip of the hat to C. L. Moore’s Jirel of Joiry. 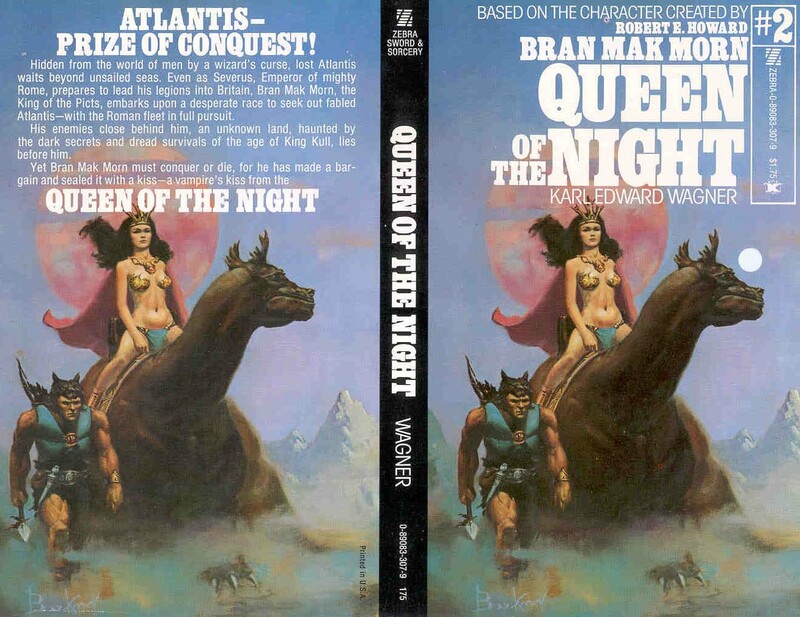 How much better off are we that Leigh Brackett created her own Mars instead of writing John Carter/Barsoom stories? 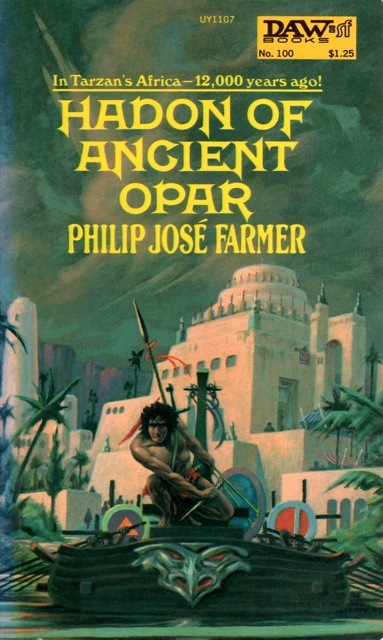 Philip Jose Farmer’s two Opar novels are something that straddles the pastiche boundary but not slavishly imitative by any reach. He used Edgar Rice Burroughs’ lost degenerate colony of Atlantis and produced in my personal opinion, two very entertaining novels. The final result is inspiration appears to edge out imitation when it comes to creativity. A heartfelt imitation is going to work once in a while but it is going to be the exception, not the rule. I think pastiches work better in short fiction. I’ve written two stories that people quite readily recognized as Maupassant’s style; my attempt at mimicking Lovecraft didn’t work any better than Charles Stross’s. It can be done, but I think it’s hard to maintain the effort over an entire novel. It’s much easier to use elements from the world rather than imitate the style as well. Move Under Ground is an interesting novel in the genre: Kerouac vs. Cthulhu. I would be curious to read those two stories.Where are they published? I recently downloaded a collection of Maupassant’s short stories courtesy of Project Gutenberg. Maybe it has been too long since I read literature proper but I can’t quite define what it is I like about them. I finish one and stew for a bit in that curious feeling, sort of a reserved elation? And I can’t pinpoint why or what exactly about the story is the principle cause. I feel like a caveman watching a 737 pass overhead. I enjoy much of the Howard pastiches, even the Jordan, just as some harmless fun. But, Morgan, thanks so much for the warning about Turtledove. That sounds horrifying! I am glad I know to avoid it. Kull- do you mean the two Elak pastiche stories? 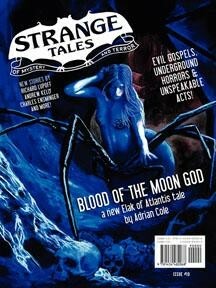 “Blood of the Moon God” is in STRANGE TALES #10 available at Amazon. The 2nd story is in the new WORLDS OF THE UNKNOWN. Order from Jon Harvey, £13.80 Sterling via PayPal, sending the money to jon.harvey@talktalk.net. Oh I meant the stories mentioned by castaliahouse. But thanks for the info. I was having trouble finding Worlds of the Unknown. “The Logfile” and “The Deported” are both published in THE ALTAR OF HATE, which is available here in the Castalia Store. It also includes “The Last Testimony of Henry Halleck”, which was the failed Lovecraft pastiche. “The Logfile” is a straightforward updating of a Maupassant story, whereas “The Deported” is merely an attempt to mimic the style in an original manner. The general consensus appears to be that they both worked pretty well. It’s one thing to straight up take another writer’s character and setting, and another to pastiche a writer’s style. I seldom find much int he first type of story (Lansdale’s Tarzan aside, but I’m more of a Lansdale fan than an ERB fan). The other kind can be truly great, blending elements into a new thing. I think of Leigh Brackett’s Stark stories like that, Tarzan lands on John Carter’s Mars, in a Western with dialog by Raymond Chandler. There’s a lot more to Brackett’s Stark than that, but you can see the influences and enjoy the story that much more. Generally, I’m disappointed by pastiches. Occasionally, when an author words in another author’s world w/o trying to imitate style it works well. But I often wonder what the impulse is to do so. I was recently asked to write in another author’s imagined Mars civilization for an anthology. Never having done anything of the sort, I found the process difficult. It involves strict boundaries and a different mode of research. There is a Baen paperback of pastiche stories set within the worlds Edgar Rice Burroughs created. I think some of the stories even use his characters. I looked at the book but decided against buying it. Joe Lansdale seems to be the king of the pasticheurs these days. The entire concept of pastiche (in genre fiction) was started by REH and Lovecraft and Clark Ashton Smith joshing around in each others’ territory. I think it is fun when colleagues do it collaboratively as a sidelight. August Dereleth attempted it with HPL in a well-meaning but ultimately counterproductive attempt to keep Lovecraft relevant and contemporary. His pastiches are not good at all, but they probably helped to position Arkham House, and thus helped ultimately preserve Lovecraft’s literary legacy during the dark ages following his death. But as a genre worth reading? I say keep it to poems and short stories…especially when it should be noted that novels that pastiche a writer most prominent for his short stories don’t make a lot of sense in the first place. It is kind of like an author making epic fantasy trilogies that are a “pastiche” of Matsuo Basho haiku. Wrong format. Given your definition of pastiche, would comic book writers fit into this category? Comic book writers (such as Roy Thomas) seem to avoid the often negative aura surrounding pastichery. Comics are a different format so they don’t seem to be included. Gardner Fox, mentioned here, wrote under a dozen pseudonyms. Have his various SF works ever been collected under his own name? Should they be? Only one of his pulp science fiction stories was reprinted that I am aware of (“Tonight, the Stars Revolt” from PLANET STORIES in Brian Aldiss’ GALACTIC EMPIRES). He wrote some entertaining stories. I tried to interest a small press publisher but no interest. I think a Fox collection would sell in large part to comic book fans who would be curious about his prose fiction.